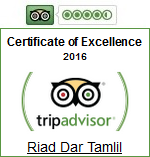 It was a great experience our stay in Riad Dar Tamlil. Even if the medinas in morocco can be a bit difficult to manage at the beginning, the riad is very well located close to place Jemaa Fna (is easy to arrive from the airport even by bus(around 30 dirhams), what is significantly cheap compared with the taxis). Awesome breakfast served everymorning that is even better thanks to the terrace they have, the good-smily service and the morocccoan sun. Special mention to Abdoul, a great person!